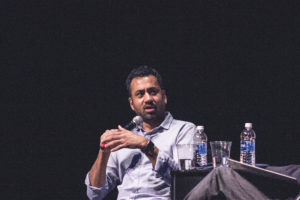 Between 450 and 500 people came to hear actor and former White House staffer Kal Penn speak at the Phillips Center on Oct. 11, 2017. 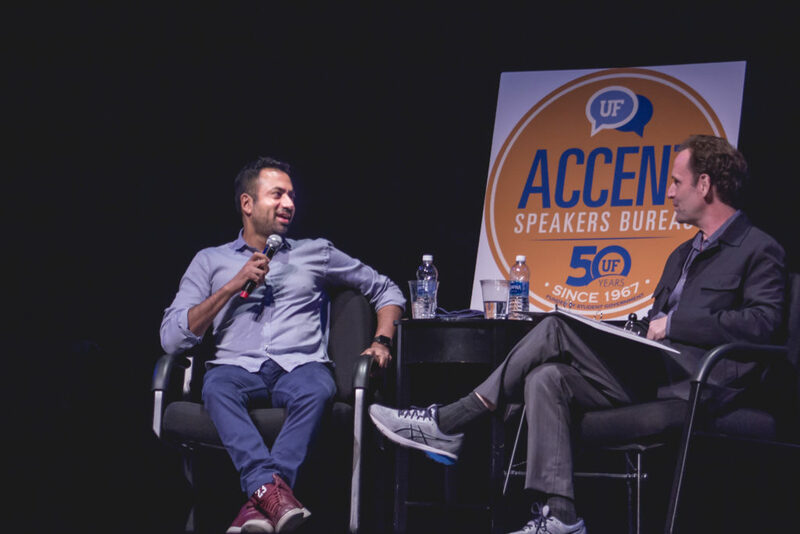 Penn was interviewed at the ACCENT-sponsored event by Malcolm Gets, a professor of practice in the School of Theatre and Dance at UF. Penn spoke about his career trajectory – from acting to a role in the Obama White House and what it’s like to be an Asian American actor. Penn attributed the publicly funded arts program in his high school to him becoming an actor – and he is still an advocate for public funding for the arts. Still, Penn said, his parents were worried about him pursuing acting. “Whether your parents are immigrants are not, it’s a little tricky to explain why something other than financial stability can make you happy,” Penn said. Penn had been at UF 10 times before. He first came to UF in 2007 and 2008 as part of the Obama campaign. When Penn was working on the TV show, “House,” Olivia Wilde invited him to see former president Barack Obama speak – Penn was expecting it to be like all other politicians who come and ask Hollywood for money but never deliver on promises. But Penn was impressed by Obama and the number of college-aged organizers he had. This coincided with a writer’s strike, which allowed him more time to volunteer for the campaign. “It wasn’t just the one person, it’s what people did together,” Penn said. To coerce him to eat his vegetables as a child, Penn’s grandparents told him stories of marching with Gandhi, which instilled a sense of public service. When he worked for the White House, he viewed it as a sabbatical from acting, always intending to go back to it after a year. He didn’t realize he was going to stay for two and a half years. “When someone’s like ‘we’d like you to serve in the White House as this youth outreach person,’ you don’t [say] ‘no, I have another stoner movie to make, sorry,’” Penn said. More recently, Penn took on political advocacy in the form of resigning with the rest of the President’s Committee on the Arts and Humanities. Much of the committee resigned prior to the inauguration, but Penn and others decided to stay, then later resigned after President Trump refused to take a side after the events in Charlottesville. While Penn did not specifically advocate for students to protest Richard Spencer next week, he encouraged students to volunteer to register voters through Chomp The Vote. 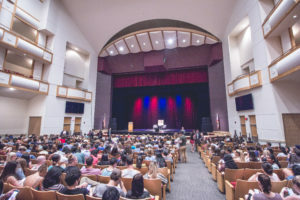 Amna Qureshi, a third year psychology major at UF, said that she felt this speaker was especially relevant given the fact that white supremacist Richard Spencer would be coming to UF the following week. Aanchel Shah said there are so few South Asians in the industry that she is aware of each and every one of them. “For UF to bring someone like that here, that I feel like looks like me, that sounds like me, that comes from a background as me, it was just important for me,” the third-year political science major said. Shah was also interested in the diverse range of careers that Penn had in fields where South Asians do not get much representation. “So many people in our fields either they’re doctors or they’re engineers, or they’re working very low wage jobs, and there’s just not much of an in-between,” Shah said. Currently, Penn plays Seth Wright on Designated Survivor. Casting of Asian Americans is lagging far behind the census data, according to Penn. © 2017 Sparks Magazine. All Rights Reserved.